“Graeme what?” I replied, as I searched for the location. Twenty minutes later we were on the road to a Colonial manor house in Horsham, PA.
Graeme Park was the name given to the plantation by it’s second owner 1, Dr. Thomas Graeme. This leads to a bit of confusion, seeing as the site is not an “open space” park, but the confusion adds to the unique nature of the house. In its heyday Graeme park consisted of the manor house, a kitchen, formal gardens, and several out buildings 2. The only original structure remaining from the Colonial plantation is the manor house, though the kitchen has been reconstructed on the original foundations. While the loss of the other out buildings and gardens is lamentable, it’s the history of the manor which makes the property so interesting. Dr. Graeme’s daughter, Elizabeth, was a brilliant woman who was considered one of the most intelligent women in the colonies. She wrote poetry, was a most diligent hostess, and debated medicine with a signer of the Declaration of Independence — Dr. Benjamin Rush 3. Her experience during the Revolution would see her host Continental Troops and oversee the manufacture of garments for the troops when she spied their wretched state. But her husband was a loyalist, and his support for the crown led her to be suspected of toryism, and subjected to the seizure of her property 4. She eventually had her property returned, but her husband departed for England and the couple never again saw each other. This story is a telling example of war’s civil nature, and the heartaches it created. The property was sold to the Penrose family, and then later to the Strawbridge family 5. And this transfer of ownership is what makes the house so unique. After 1821 the Penrose family moved into another house they had built on the property but left the Colonial manor house as it was, right down to the paint and intricate wood paneling. When the Strawbridges took over ownership, they followed a similar pattern. The house has never been retrofitted for electric lighting or indoor plumbing. In fact, other than maintenance of some doors and floors, the only upgrade to the structure was a heating system installed by the state in the 1960’s. I have been to many reconstructions and restored historic buildings, but Graeme Park is the first which has been left in the state in which it existed since before the Revolution. The unique nature of this history is seen in the cast iron plates in two of the fireplaces — marked with dates 1758 and 1728. They’ve not been moved in over two centuries. In addition to these plates number of original doors, floors, hardware, and the same panelling which Dr. Graeme installed this building gave me glee-filled chills. If you happen to be in the Philly area, and are looking for a good way to spend an hour or two, Graeme Park is a terrific destination. When visiting pay attention to the story of the home and ask questions while on the tour. It make the experience more immersive. 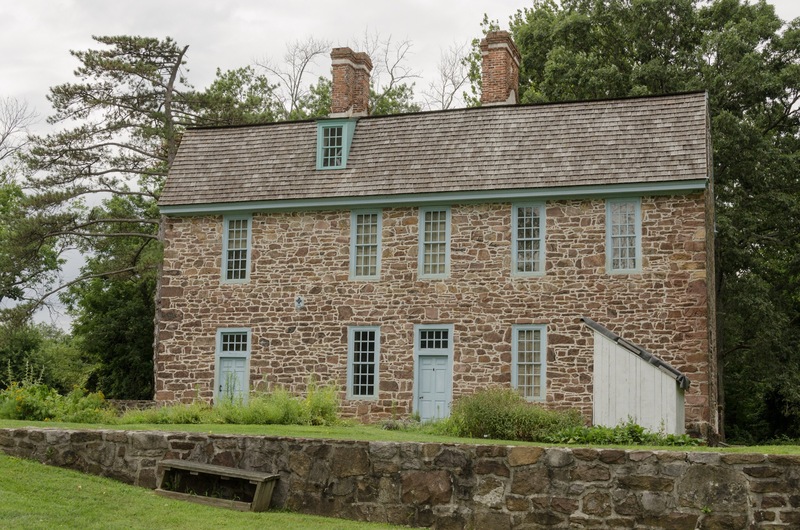 Also, for those looking for “hands on” history, the site is offering a Hearth Cooking Class on August 6. For my photos of this unique bit of Pennsylvania, follow this link to my SmugMug page.